This salamander is inflammable. He finds the fire perfectly habitable. The obvious follow-up from last month’s contronyms - the same word with two opposite meanings - are those sets of words that look like they should mean the opposite but in fact mean the same. I couldn’t find that there’s any name for such words, I’m sorry to say, but you all know what I mean: flammable/inflammable. flammable/inflammable - Inflammable is the older word in English and comes directly from Latin, where the in- prefix in this case actually means “in” (as in “in flames”) rather than “not.” I don’t know why people started using flammable, some two centuries later, but probably just because inflammable sounds so much like it ought to mean not flammable. For another century the older inflammable was more common in the US, and the newfangled flammable more common in Britain. It was during World War II that flammable really became widespread on both sides of the Atlantic. When the USA joined the war, the Allied leaders asked them to label explosives with “Flammable” so as not to cause confusion - and explosions. embowel/disembowel - Disembowel is certainly the standard word nowadays for removing innards (not that it’s something people talk about all that much.) However, it’s the later form, and came about in a funny way. Embowel came from French in the early sixteenth century, and the em- prefix meant “out,” so it was a perfectly reasonable word. Meanwhile, English already had the word disbowel meaning the same thing, also perfectly reasonably. I think you can see where this is going. For reasons I do not know, speakers decided to do a mash-up, and around 1600 the doubly negative disembowel appeared, and has since effectively taken over the innard-removing duties in the English language. This one is flammable, and he finds the fire inhabitable. privation/deprivation - This is a simple one. The prefix de- in Latin could reverse a verb’s action and make it opposite, as in defrost, derail… or debone. That’s why we see privation and deprivation and think they look like they ought to be opposites. But the Latin de- could also be an intensifier, especially in front of verbs with negative meanings to begin with, and that’s what it’s doing here. Deprivation is utter, complete privation. Oh, Latin, Latin, Latin. Why must you confuse us so? caregiver/caretaker - My final pair today are fun because they aren’t a matter of a simple prefix. They’re both relatively new words, caretaker dating from the mid nineteenth century, and originally meaning a steward, or someone who takes care of property and things rather than people. Perhaps that’s why caregiver appeared around 1975 - to imply a role that was more about human interaction. The funny thing really is why taking care and giving care are the same. It probably has to do with care’s troubled origins. When care meant “sorrow, anxiety, trouble,” it was consistent to take it on someone’s behalf. As the meaning shifted to “an inclination for, fondness,” and eventually “love,” it seemed more natural to give it. 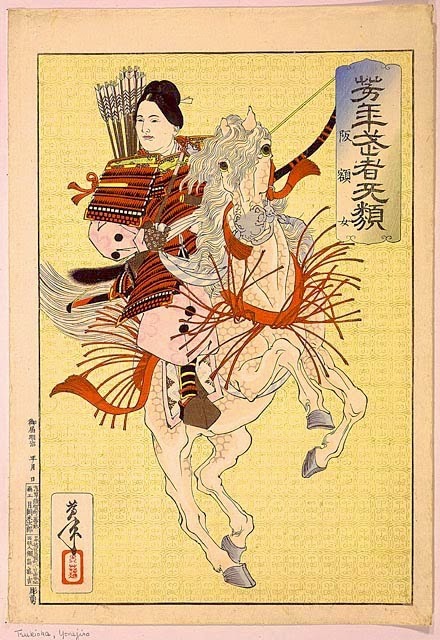 March being Women’s History Month and all, I figure this is a good time to show you a small collection of old wood block prints depicting warrior women. Now, as a pacifist myself, I’d just as soon there be fewer male warriors rather than more female warriors, but nevertheless these women are an interesting bunch. How history has treated them is always interesting, too. 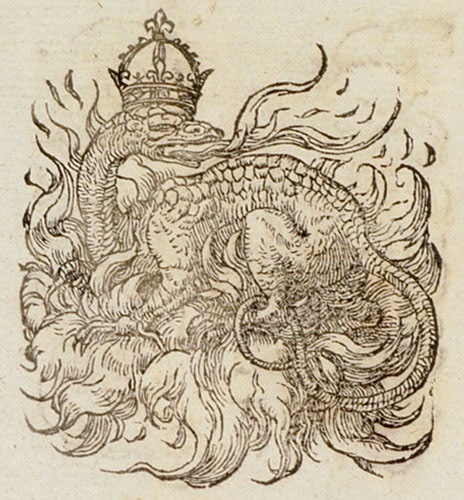 Of course, the focus here is on their depiction in the noble medium of woodcut. 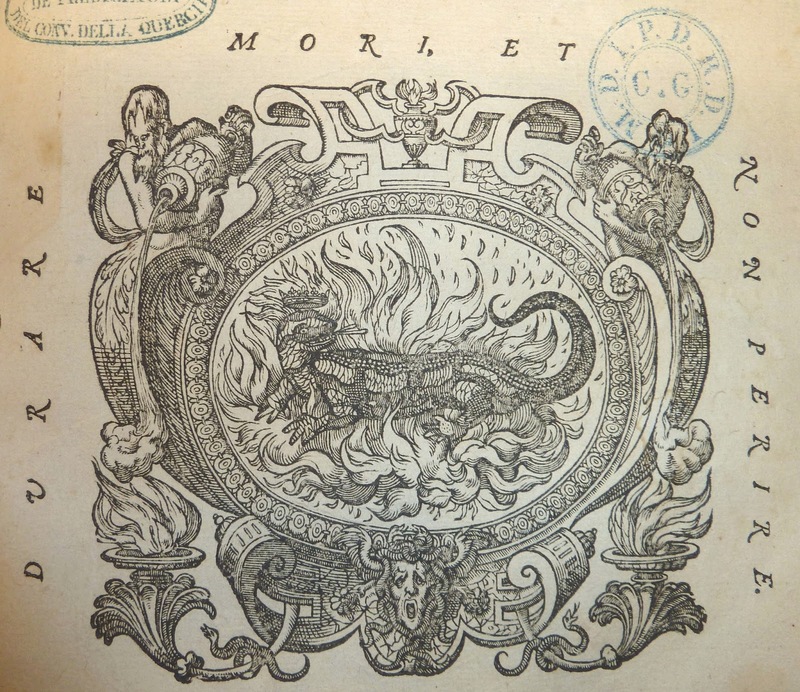 I’ll go chronologically, as more befitting my historical subject, and begin with our old friend Olaus Magnus, chronicler of the Nordic peoples. Apparently the subject of warrior women was so fascinating to him that he took a couple of chapters away from the North to discuss Amazons and other martial women around the world. These two on horseback have long hair, short skirts, and all too effective-looking weaponry. 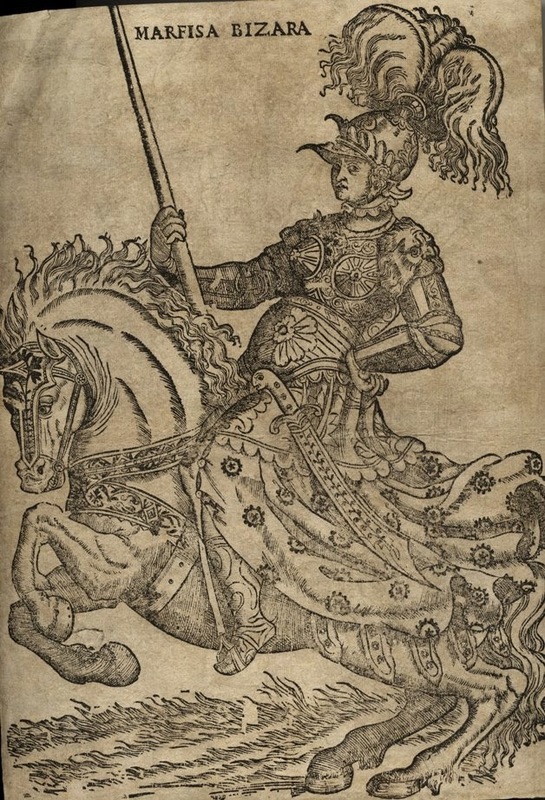 This magnificent woodcut in the style of Dürer shows a woman warrior with a breastplate and shoulder guards that would make any fantasy costumier proud. There are a lot of really cool details, including the worm’s head of her scimitar’s pommel, the lions’ heads on her shoulders, and the beautiful patterns on her shins, trappings, and textiles. Indeed, she’s so incredibly cool that her horse doesn’t even have reins. She battles with one hand on her hip, she’s just that in command. By contrast, this piece from the Revolutionary War era is the most stiff and primitive of the bunch. I love her knowing little smile, though. She’s not going to take any nonsense from any Redcoat. She’s also our only warrior modern enough to use a gun. 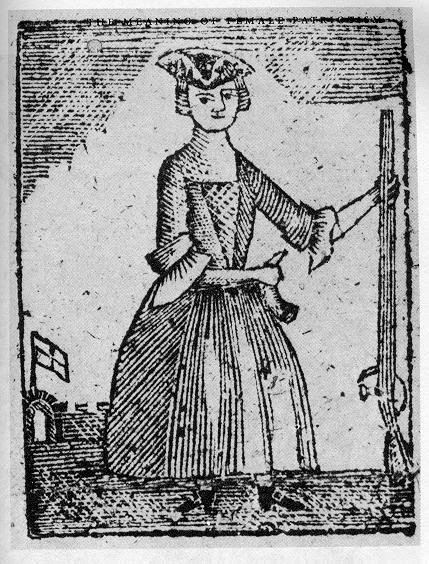 There were a number of women recorded as fighting in the Revolutionary War, most disguised as men. I don’t know whether this is intended to represent any of them in particular. Though it's the most recent woodcut today, this last one represents one of the more ancient historical women: Han Gaku, who lived around 1200. Like Boudicca (and so many others who live by the sword) she was ultimately defeated. 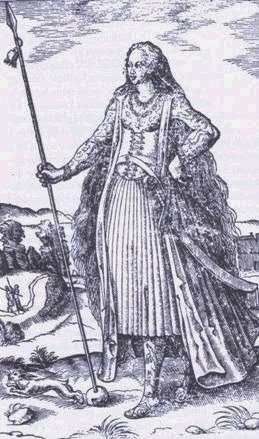 Unlike Boudicca, however, she was saved from death by a male warrior who wanted to marry her. Of course I have no idea what she thought of marrying this man, though presumably he seemed preferable to a violent death. She looks rather stubborn in our woodut, so I hope the man loved her for her courage and battle skills rather than expecting a wife who would be meek and subdued. The trope of the woman warrior has a long history in fantasy, from Hippolyta, to Bradamante, to Eowyn, to Black Widow. They often end up dead or “tamed,” like Boudicca and Han Gaku, which some feminists find understandably annoying. I can’t say I generally mind much when people give up war - I just wish more of the men would end up “tamed,” too! 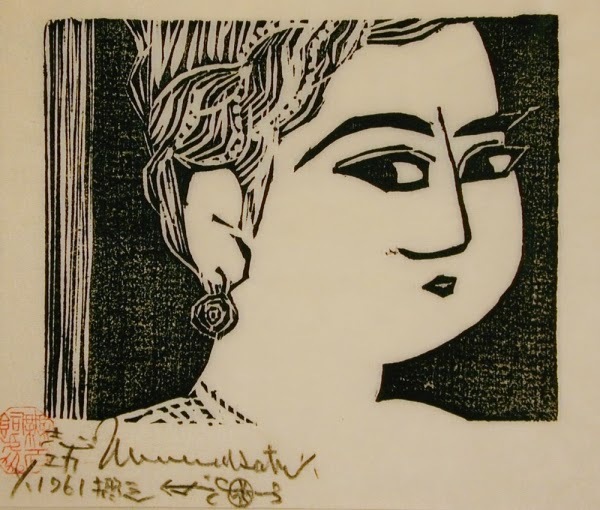 Shiko Munakata (Japan, 1903-1975) was a woodcut artist who emphasized the importance of the wood and the block rather than the artist’s will. According to Frank Castle, “he worked in a very rough and aggressive manner, and often used the ends of boxes, very rough wood, like orange crates, and then he would use chisels, and… just work frantically and often would carve a block within a matter of a few minutes.” Clearly this was a major departure from the incredibly controlled traditional Japanese hanga technique. It was more consistent with movements in Western art of the mid-twentieth century. 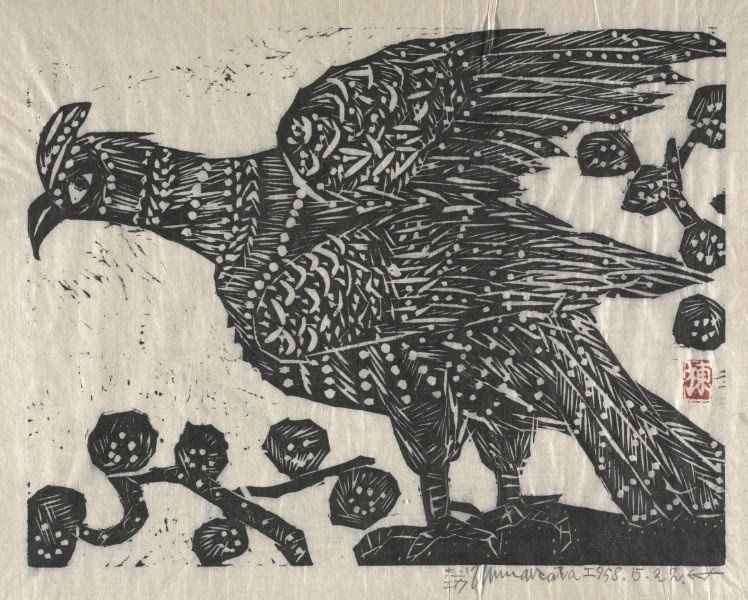 true materialization.” I suppose this should comfort all my doubts about my own Variations on a Traditional Theme woodcut and its many mistakes! Certainly you can see in Munakata’s work that he wasn’t bothered by irregular gouges or rough backgrounds. This first piece above is my favorite. I really love the composition with the little bird amid the tangle of branches. 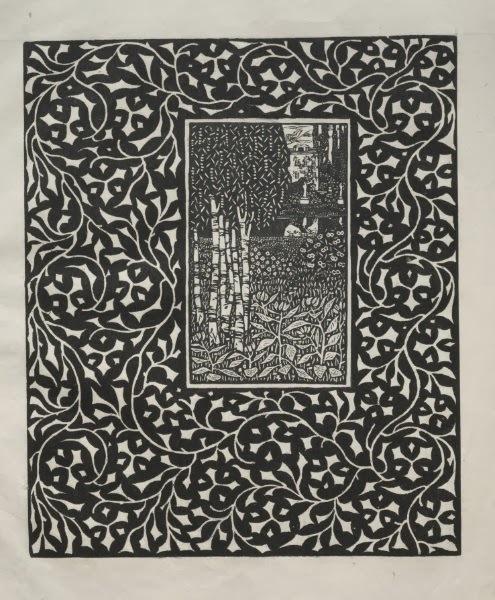 Another of Munakata’s claims was that “It is inherent in the woodcut that it can never be ugly.” I’m afraid I can’t agree with him there! 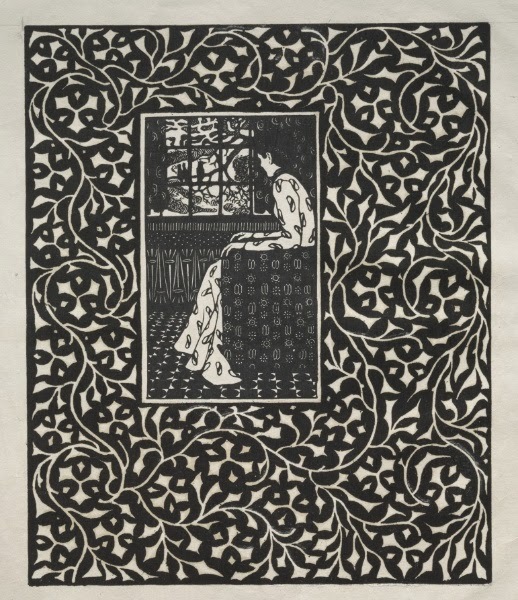 Munakata did a number of woodcuts that I don’t find pleasing at all, particularly of people. I’ve included this woman’s head because it’s my favorite of his people that I saw. She is a lot smoother and more controlled than much of his other work, and her features with her tiny mouth are quite traditional, as well. I like this hawk a lot. The rough, unplanned carving works well for the pattern and texture of rough feathers. The patterns continue on the twigs and flowers around the edges. The hawk completely fills the block, going to the very edges, which I think is an interesting composition choice. 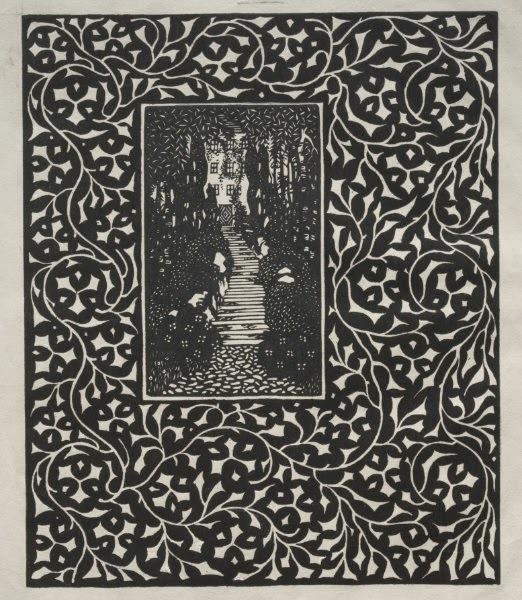 One final quotation from Munakata, a bit grandiose and pretentious perhaps, but pleasing (if amusing) to any true block print lover: “Like the vastness of space, like a universe unlimited, untold, unattainable, and inscrutable - that is the woodcut.” Oh, yeah! Frank Castle quotation from Antiques Roadshow. 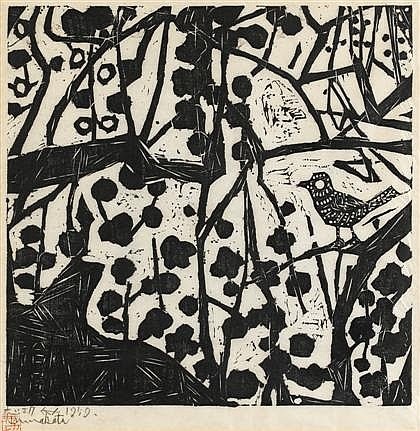 Shiko Munakata quotations from Munakata: the “Way” of the Woodcut, 1961. It’s time for me to harp some more on the value of fantasy in developing the human imagination and intellect. But don’t take my word for it. Here are a few much-admired achievers in a variety of real-and-earnest scientific fields explaining how important they deem creative fantasy. Carl Jung (1875-1961) was the enormously influential psychiatrist and psychotherapist who founded analytical psychology. (I’ll forgive him the sexism of his wording, seeing as he was born in 1875.) It may seem obvious that nothing is created that isn’t first imagined, yet just this week there was a letter to the editor in my town newspaper making once again the ever-popular claim that the arts are a waste of time and money in our schools because they aren’t practical. But what could possibly be more practical than giving our children the tool they need at the most basic level before they can accomplish anything productive at all: the tool of creative fantasy? It has been written that the shortest and best way between two truths of the real domain often passes through the imaginary one. Jacques Hadamard (1865-1963) was the mathematician who made major contributions to number theory and differential geometry (among other things.) He was also particularly interested in how creativity works, and around 1900 he surveyed 100 leading physicists about their own thought processes. You can see something about his conclusions in the comment above, finding that introspection, wordless imagining, and spontaneity were at least as vital as logical, calculating cognition. Now I’d absolutely never say that we don’t need logic. Indeed, we clearly need a lot more of it than we currently see! But I’ve said it before and I’ll say it again, that we need logic paired with imagination -- and that one of the best tools there is for fostering imagination is fantasy. Here are three wood block prints from a series of eight by Carl Krenek (Austria, 1880-1948). The series is called “Four Seasons,” and as it consists of eight, I’m assuming 2 views for each season. I’ve put number 8 first here, since it looks a lot like I feel now, sitting inside looking out at the cold and snow. 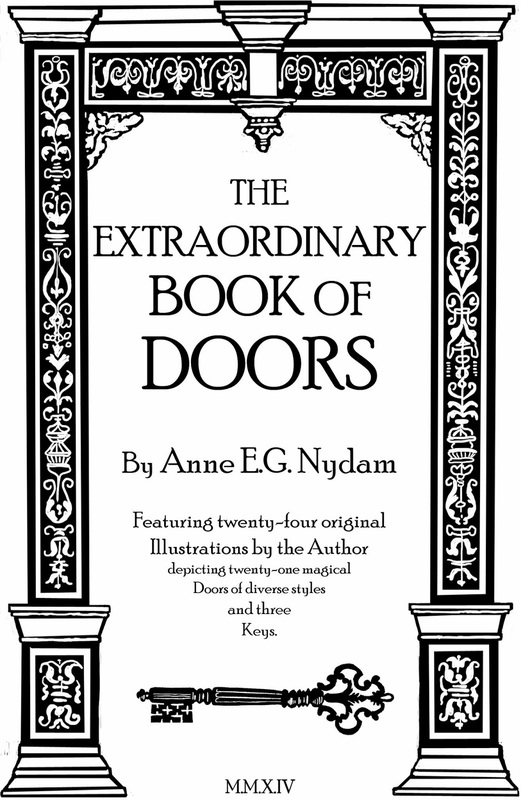 look at the borders, you’ll notice that there are two different designs, while two of the borders are exactly the same. In fact, there are only two borders for the set of eight pictures. I don’t know whether Krenek printed the borders and the pictures separately, or whether he made them the same thickness so he could fit the picture inside the center of the border and print as one large block. This second piece is number 2 of the series, and as I’m assuming that they go in order and end with winter, that would make this the second of two views of spring. I wish I could see these a little bigger and sharper - are the white blobs along the path the remnants of melting snow? But everything seems to be in full leaf and flower, which would imply that the snow should be long gone. I’m afraid I just can’t tell, but regardless of seasonal accuracy, I do like the different patterns of the different bushes, and the framing of the big building in the distance with its fancy door. And finally, summer. (Yes, I like the sound of that!) What a lovely grove of birches, and what a fun stylized pattern for their leaves. I like the contrast of the plants in the foreground with the more abstract patterns representing things in the distance. And around all these scenes, the marvelous, swirling, neo-medieval borders. They make even the winter scenes lush and luxuriant. Tomorrow is World Read Aloud Day, and it’s a good reminder of the vital importance of reading aloud to children to help them develop literacy. 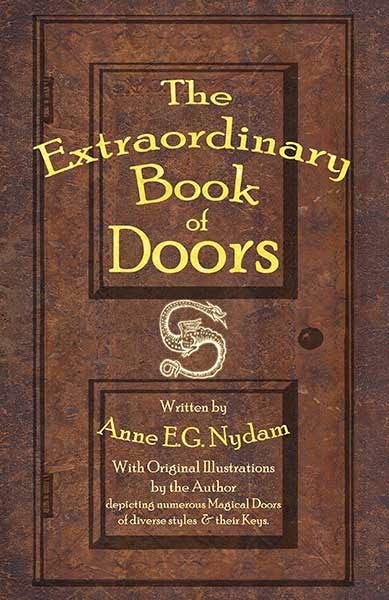 I’m on about this stuff all the time, so today I wanted to focus on one particular benefit of reading aloud to children that I don’t think I’ve mentioned before: it’s one of the best ways to introduce them to the older classics with more complex language. Stereotypically it’s assumed that children won’t read stuff with archaic language or long complex sentence structures. Such books will confuse and bore them, and they’ll give up and go look for something with sentences that go “Boom! Zap!” This may indeed be true if no one ever teaches children that they can handle older books - that they can understand them, that their language has its own joys, and that they can find incredible stories in their pages. And the best way to teach them is to show them. Read these books aloud and children will become familiar with the patterns and vocabulary of past ages of books, they’ll hear the stories and enjoy them, and in the future when they encounter similar writing styles, they won’t be thrown off by it, or assume that it’s old and therefore boring. Here’s a list of older fantasy books worth reading aloud to children. The Princess and the Goblin by George MacDonald - Full of Victorian syntax, vocabulary, and occasionally sentimentality, MacDonald’s books are also full of evocative descriptions of magical moments, and of rousing adventure. This one features a sweet young princess, her magical “grandmother,” a brave young miner, and an underground kingdom of evil goblins plotting conquest. It also features ideals of virtue, trust, honesty, courage, and Trying to Be Good, which give the story more depth. Those may make it tougher for children to read by themselves, but if you read aloud to them, what they’ll really notice is the danger, mystery, adventure, and triumphant ending. Alice in Wonderland, by Lewis Carroll - When kids aren’t confident readers, made-up or deliberately misspelled words can really throw them. It’s helpful to have a grown-up reading the nonsense words aloud so that kids can hear that they’re not supposed to know this word already - and if they’re still confused, there’s someone right there to ask. But on the whole, kids adore absurdity. And that brings me to another category that works well both for introducing children to more old-fashioned language and for reading aloud. Short stories make excellent bite-sized (or perhaps I should say bedtime-sized) treats to share. Here are some excellent ones that kids might not be inclined to read on their own, but which will reward reading together. 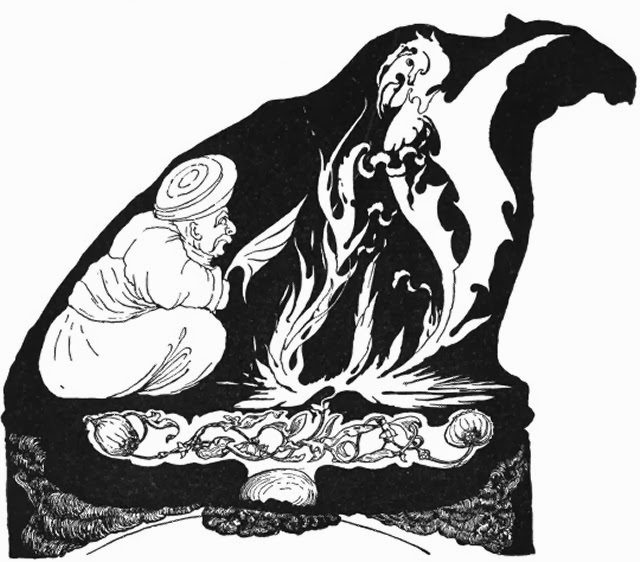 Arabian Nights - There are lots of versions of these stories, from unexpurgated collections that are not at all appropriate for children, to modern versions that kids can no doubt pick up easily enough themselves. The version we read, however, from the “Illustrated Junior Library” (illustrated by Goodenow, but with no credited author), had a lot of fun with very formal, flowery language. The deliberately archaic language really contributed to the feel of princes and princesses in exotic lands, which was a major feature of the stories both in their original and in their appeal to English speakers. Fairy Tales by Hans Christian Andersen (or older collections of fairy tales from Grimm or around the world) - I have to admit to not being a huge fan of Andersen’s tales on the whole, but if you do want your kids to know and love them, it’s probably a good idea to read them aloud. In all the Victorian fairy and folk tale collections there’s enough old-fashioned language, and enough general weirdness, that it’s helpful for kids to hear them read aloud. And of course the bonus is that you can then discuss them together. Just So Stories, by Rudyard Kipling - These are meant to be read aloud in any case, with their obvious delight in the sounds and rhythms of language. But this may be the place for one other note about older books. Wonderful though they are, many of them do include elements of racism, sexism, and other problematic issues. Reading aloud allows the adult the opportunity to edit and/or stop and discuss as necessary. This, too, is a great learning experience for kids and adults alike.